In the British Isles, France, and elsewhere in northwestern Europe it is in severe population decline. This is partly because changed farming practices mean that the weed seeds and shoots on which it feeds, especially Fumitory, are scarcer, and partly due to shooting of birds on migration in Mediterranean countries. 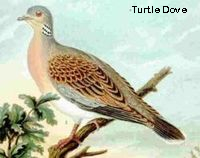 Smaller and slighter in build than other doves, the Turtle Dove may be recognised by its browner color, and the black and white striped patch on the side of its neck, but it is its tail that catches the eye when it flies from the observer; it is wedge shaped, with a dark centre and white borders and tips. When viewed from below this pattern, owing to the white under tail coverts obscuring the dark bases, is a blackish chevron on a white ground. This is noticeable when the bird stoops to drink, raising its spread tail. The mature bird has the head, neck, flanks, and rump blue grey, and the wings cinnamon, mottled with black. The breast is vinaceous, the abdomen and under tail coverts are white. The bill is black, the legs and eyerims are red. The black and white patch on the side of the neck is absent in the browner and duller juvenile bird, which also has the legs brown. The nuptial flight, high and circling, is rather like that of the Wood Pigeon, but the undulations are less decided; it is accompanied by the whipcrack of the downward flicked wings. The arrival in spring is heralded by its purring song, a rather deep, vibrating “turrr, turrr”, from which the bird's name is derived. The nest is even more flimsy looking than that of the Wood Pigeon, being built of more slender twigs, usually at no great height, in a tree or old untrimmed hedge. The two white eggs are laid late in May or in June, often with a second clutch in July or August. the Asian Oriental Turtle Dove S. orientalis and Spotted Turtle Dove S. chinensis.the African Dusky Turtle Dove S. lugens and Laughing Dove S. senegalensis. S. senegalensis and S. chinensis have been introduced into Australia. A New World(1) dove of similar appearance and behavior to that of the Turtle Dove is the Mourning Dove. (1) New World is one of the names used for the Americas.